(Facebook)Subway customers are whipping out their measuring tapes after Internet postings that claim a short-shrifting of the worldwide chain's famous footlong sub, putting the Milford, Conn.-based company in the hot seat. The controversy began Tuesday in Australia, when a very precise customer, identified as Matt Corby of Perth, ordered a footlong sub and then pulled out a tape measure. 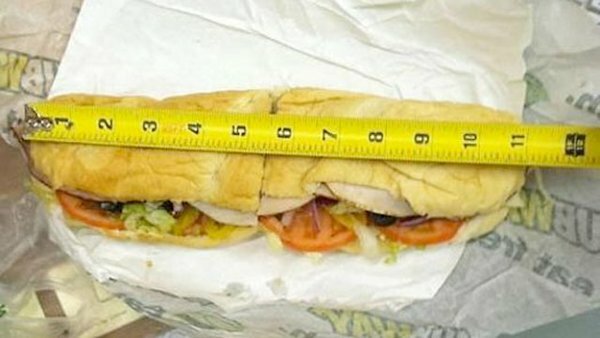 Corby found the sub measured only 11 inches long and took his outrage to Facebook, where he posted a photo of his sub alongside the tape measure on the company's page with the caption, "subway pls respond." The page with Corby's photo appears to be no longer available on Facebook. Screengrabs taken of his image and reposted online show the photo quickly received more than 131,000 likes and thousands of comments. The photo also sparked an abundance of photos on Facebook of subs being measured and countless comments on Subway's page, ranging from "I think they [Subway] owe us some," to "there are way more thing in life to worry about then 1 inch of sub." The New York Post followed up on Corby's complaint with a New York City-based investigation of its own and found Corby's experience to be more the rule than the exception. According to the Post, four out of seven "Five-dollar Footlongs" purchased at Subways in Manhattan, Brooklyn and Queens, measured only 11 or 11.5 inches. A local franchise owner told the paper the chain has cut the portions of their cold-cut meats by 25 percent recently and raised the cost of food to individual store owners. Subway attributes the discrepancy in sub length to the fact that the bread is baked fresh daily in each of their 38,000 restaurants. They do say, however, they are looking into the matter. "We are committed to providing a consistent product delivering the same amount of bread to the customer with every order. The length however may vary slightly when not baked to our exact specifications. We are reinforcing our policies and procedures in an effort to ensure our offerings are always consistent no matter which Subway restaurant you visit," the company said in a statement provided to ABCNews.com today.